Nevin Aladağ, City Language I, 2009, Video, 4:45 min, Split screen projection, courtesy: Nevin Aladağ, copyright: TANAS Berlin. During the month of June I traveled to Berlin to spend some time with curator Barbara Heinrich of the Tanas Gallery while witnessing her and her staff install a solo exhibition of the Berlin-based artist Nevin Aladağ. 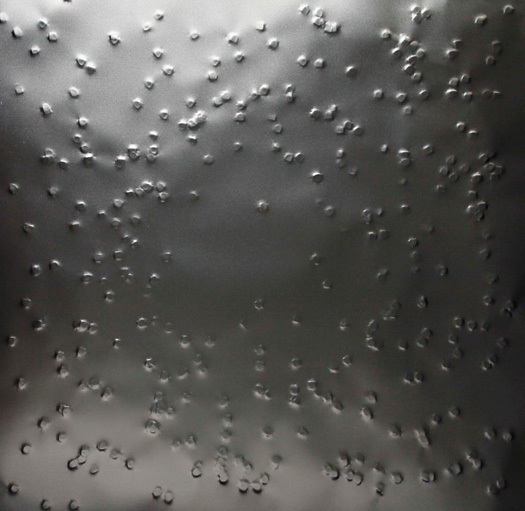 Having lived in Germany for most of her life, Aladağ is a Kurdish/Turkish/German artist who has previously created work about the place where cultural horizons meet—whether such a meeting point is embedded in objects or expressed through individual and group actions. In her recent exhibition, titled Nevin Aladağ: Dim the Lights, 6:07, Aladağ’s works toggle between the impulse to push back against social and cultural conventions while acknowledging the fact that cultural ties and social bonds are what sustain us. Expressive freedom and individuality can only be achieved within certain limitations, even if those limitations are as general as conforming to the grammatical rules of a given language. Rather than striving to cultivate a distinct individuality that is staunchly independent, Aladağ seems to suggest that freedom can perhaps be attained momentarily, by losing one’s self in a crowd. 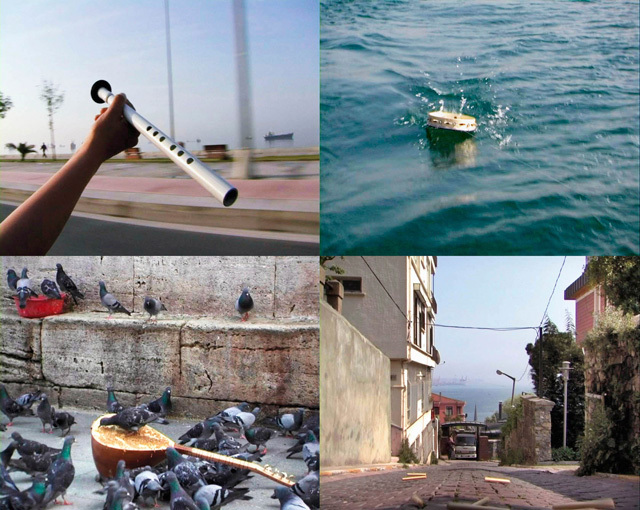 In three video works titled the City Language series (first displayed at the 2009 Istanbul Biennial) music emerges as a leitmotif with liberating potential. 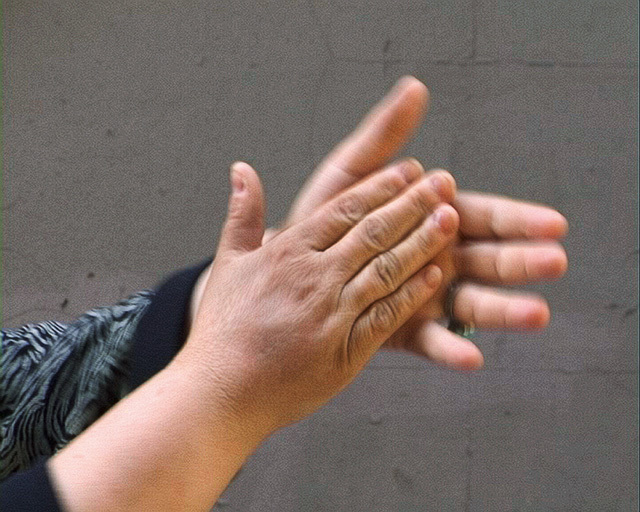 In City Language II, Aladağ has edited together short sequences of hands clapping out a tune, where different people’s hands clap out different songs. Spliced together, the various hands make a collective song that is hard to recognize. The music made by the hands suggest a different mode of communication between disparate individuals than one tied to the confines of a given language, perhaps with the potential for increased inter-cultural dialog. City Language I is shot in Istanbul, where four traditional Turkish instruments are exposed to the elements of the city to produce sound. The ney (which is a wooden flute) is held out to window of a speeding car, in order to be played by the wind. The tambourine is tied to the back of a speeding boat, letting the waves of the Bosphorus strike it. A saz (a stringed instrument similar to the shape of a lute) sprinkled with bird feed attracts pigeons who strum out a tune with their pecking. Lastly, a handful of wooden tubes from a wind-chime are thrown down a sloping cobblestone street, click-clacking their way down to sea level. Aladağ’s decision to substitute the city for the body to play these instruments suggests that the body may be nothing more than the product of its environment. Yet, what of the possibility of transgressing the limits of one’s environment, especially if those limits prove oppressive? Perhaps my interpretation of Aladağ’s sculptures are restricted by their materiality, but I do sense in them a less positivistic ability to achieve the freedom that’s conveyed her videos. In a series of sculptures titled Stiletto, six square steel plates hang on a wall, bowed slightly in the center, and pockmarked with the outwardly protruding imprints of stiletto heels. 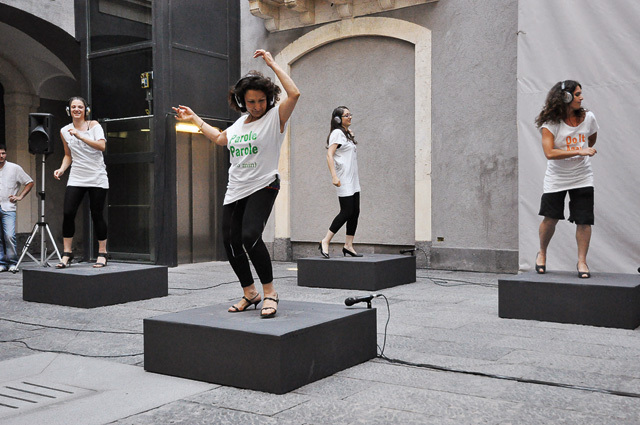 These plates are artifacts of performances in which Aladağ invites female acquaintances to step up onto platforms made of steel plates, listen to music through headphones, and hammer their dance steps onto the platforms with their high heels. Although each plate in the Stiletto series is different, depending upon the dancer’s steps, and titled after the song she listened to, in sum, they bear a striking uniformity with one another. In effect, the plates look best as multiples, like the women in A Chorus Line. Indeed, photographs from the actual performances printed in the exhibition catalog show the dancers conforming to a certain level of uniformity by wearing very similar outfits—long t-shirts with slogans silk-screened on them, black leggings and high heels. However, it is unclear where the potential for rupture may be in Stiletto‘s strictly controlled group action, limited to the confines of a tight square. Perhaps if the women had kicked off their heels, or stepped down from the platform, they would have offered a more perceptible rupture, but, the traces left on the steel plates suggest that the dancers stayed on the platform as instructed. Dance, as the manifestation of music’s effect upon the body, is a ritual that instructs the body to conform to gendered, sexual or cultural-specific codes. The body thus becomes inscribed with a specific identity as it moves through the world (for example, most Turkish girls can shimmy their shoulders and shake their hips in imitation of belly dancers by the age of five). Rather than growing into any innate essence of itself, the body is constituted by the social codes it is exposed to, which thereby determine the social interactions it engages in. Yet there is something undeniably euphoric about being able to dance, and being able to dance well, to the point where the moves become second nature. Could Aladağ be suggesting that while freedom from social determination is impossible, that one can expose oneself to a greater diversity of influences and interactions to expand one’s landscape of social norms? This can be as simple a gesture as learning different dance vocabularies. By learning and mastering these individual moves, perhaps one can improvise their unique combinations within one’s own body. The same goes for the act of speaking. If the individual’s voice is dispersed amongst a multiplicity of voices, the individual may have the courage to speak more freely. This is precisely what happens in some of Aladağ’s performances and interviews, where she opts to have the group speak for herself as an individual. Even the above quote about dance is not attributable to Aladağ, but is drawn from questions she poses to various acquaintances, their answers published anonymously as the product of an “interview” with the artist. This is different than adhering to a “group mentality” where everyone shares the same opinion. It is an identity brought into being through social engagements that allow for difference, contradiction and even conflict. Utilizing music and dance, the performative nature of much of Aladağ’s work explores border territories where individual affinities and social expectations come into contact. Rather than only producing a clash of sensibilities, Aladağ suggests that these symbolic borders can be informative sites of exchange. Her work may be an effort to improve her own dexterity in navigating them, thereby allowing a greater level of mobility in and across cultural encounters. My travels were funded in part by the Susan B. Anthony Institute for Gender and Women’s Studies. Berin Golonu is a freelance writer, curator, and a doctoral student in the Visual and Cultural Studies Program at the University of Rochester. Posted in content, on artists and tagged Barbara Heinrich, Berlin, Dim the Lights, Nevin Aladağ, Tanas Gallery. Bookmark the permalink.